The melting of glaciers, the rise of the oceans, and the potential depreciation of land are all serious concerns surrounding global warming. The evidence of global warming is showing proof through the extinction of various species and populations, along with the changes in the weather. The effects that the warming could have on land include changes in favorable countries and increased growing seasons. If the glaciers melt, the oceans will rise, flooding beaches and land along the coast. Already warm regions, will become inhabitable, leading to an increase of population in other regions. This influx of people, will create the need for more living areas, as well as more food. In agriculture, this global climate change reduces freezes, creating a longer growing period. This longer season, allows for increase in growth and production. The warming of the environment will cause the glaciers to melt, causing the sea level to rise. The biggest fear related to climate change and water is that rainfall will shift from the agricultural regions to the oceans and deserts. This will decrease production and increase food prices. This lack of fresh water might lead to dehydration and starvation due to decreased production in agriculture. According to the treasury office of the UK, if we do not adapt, global warming could reduce the gross domestic production from the world economy by 20 percent. These adaptations include trying to find ways to slow, or manage, warming. This also includes finding new ways to deal with the new climate in everyday life. The land available for agriculture could be affected in many ways. For one, the land used in agriculture today, might not be favorable for crops if global warming continues, but other regions may become more favorable for growth. Secondly, if there is a lack of water and longer growing period, plant production might suffer. The variety of crops the world produces might also have to adapt depending what will grow in the new climate. One cannot deny that the world is warming, and we as the agriculture industry need to start developing new ways to grow crops. Abigail Hill is a student at The Ohio State University, majoring in Sustainable Plant Systems: Agronomy, with a minor in Agricultural Systems Management. She is the Vice President of the Ducks Unlimited club on campus. She was born and raised on a family farm in central Ohio. She is currently working as an Ohio State Extension Intern in Pickaway and Madison Counties. Introduction: The recent decision made by the Trump administration to exit the Paris agreement has disappointed many environmentalists though it has reignited a conversation about the threats of climate change and the urgency with which we must respond. With this on my mind, I was curious about the links between plant pathology and climate change and found one particularly interesting example in California. Background: Some scientists have started to predict the effects that climate change will have in the coming years on plant disease. Predictions include: increased susceptibility of major crops as a result of, droughts, floods, and reduced soil quality, larger geographical distributions of pests and disease, and earlier spread of pests and disease each season as a result of warmer weather (Elad and Pertot, 2014; Pautusso et al., 2012). California’s northwest coastline is known for the famed redwood trees, sequoia sempervirens, some of the largest and tallest trees in the world reaching up to 378 feet tall (Sequoia & Kings Canyon National Parks, 2017). 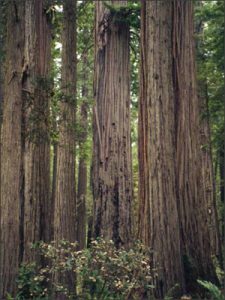 The trees of the Redwood National and State Parks are considered old-growth, with most trees averaging 500-700 years old and some possibly up to 2,000 years old (National Park Service, 2017). Redwood Susceptibility: As average global temperatures continues to rise, the risk of severe forest fires also increases by creating favorable conditions for forest fires and extending the forest fire season (Schlossberg, 2016). Redwoods are known to be relatively resilient against forest fires. However, a recent study published in the journal Ecology found that redwoods are four times more likely to die from forest fires if they are infected with sudden oak death (Phytophthora ramorum) (Dybas, 2013). As this disease spreads through California killing millions of coast live oaks and tanoaks, dead trees left in its wake act as fuel to strengthen and spread wildfires that may otherwise be less severe. Redwoods cannot survive the increased intensity of these fires, especially if they themselves have succumbed to sudden oak death. Concluding Thoughts: The beauty and diversity of the natural world, both today and in the future depend on the decisions and actions we are making right now. Although the consequences climate change will have on plant health can only be estimated now, research suggests that we should not wait to see the consequences but must start taking aggressive action to mitigate climate change, not reverse the work that has already been done. Kori Goldberg is a student at The Ohio State University pursuing her Master’s in Environment and Natural Resources. In her free time she loves to be outside, whether climbing, kayaking, or enjoying green spaces in Columbus. Dybas, Cheryl. “California’s iconic redwoods in danger from fire and infectious disease.” National Science Foundation. NSF, 21 Aug. 2013. Web. 8 June 2017. Elad, Yigal, and Ilaria Pertot. “Climate Change Impact on Plant Pathogens and Plant Diseases.” Journal of Crop Improvement 28.1 (2014): 99-139. Web. 6 June 2017. Fig. 1. Redwood Trees. 2015. Pixaby, Yosemite National Park. “Frequently Asked Questions.” National Parks Service. U.S. Department of the Interior, 2017. Web. 10 June 2017. “Giant Redwoods and Sequoias.” Giant Redwood Trees | Giant Redwoods. Sequoia & Kings Canyon National Parks, 2017. Web. 10 June 2017. Pautasso, Marco, Thomas F. Döring, Matteo Garbelotto, Lorenzo Pellis, and Mike J. Jeger. “Impacts of climate change on plant diseases—opinions and trends.” European Journal of Plant Pathology 133.1 (2012): 295-313. Web. Schlossberg, Tatiana. “Climate Change Blamed for Half of Increased Forest Fire Danger.” The New York Times. The New York Times, 10 Oct. 2016. Web. 8 June 2017. My name is Austin Pelyak. I am an Agronomy graduate and I want to share some information about herbicide resistance. Herbicide resistance has been a growing problem among growers throughout the United States and the world. In the United States alone, we have 155 known species of resistant weeds. This is becoming a pandemic across the US as farmers use more and more of the same herbicide on the same weeds. This is how resistance builds up and becomes an issue. The herbicide has a specific mode of action (MOA) and after repeated sprays with the herbicide, the weed builds resistance to it rendering the herbicide virtually useless. How can we stop this from happening you might ask? How can we prevent more weeds from becoming resistant? It’s simple, rotation. Rotation of herbicides with different MOAs is essential in curbing resistance. Another rotation that should be used is the rotation of different crops in the field, like corn to soybeans then soybeans to wheat and wheat to soybeans then back to corn for agronomic crops. Different crops shade out or outgrow different weeds. Tillage is also an effective method of destroying weeds and burying potential seeds that will sprout in the spring. Cover crops alone can reduce weed pressure by 50%. It is the simple things growers can do to make resistance a thing of the past and allow future generations to not worry about resistant weeds. In the last few sections of class, we learned about biotechnology and how the science of genetic engineering is performed. While we only discussed the science in depth with plants, there is a lot of science being researched on genetically engineering humans. Designer babies are when parents get to literally “design” physical traits, such as gender, height, or eye color. It is not limited to physical traits however, as more and more evidence is being done that suggests that intelligence and athleticism is also encoded in our DNA. I have watched a documentary on in vitro fertilization, where a procedure can be done to determine physical characteristics in a baby. First, what the scientists do is pull out a sum of eggs from a woman. This group of eggs are then sent to a lab, fertilized with sperm, and then further analyzed into test results that can finally show which fertilized egg had the gene for a desired eye color. The procedure can even extend to calculating susceptibility rates for genetic diseases. After a desired fertilzed egg is chosen, it is then implanted back into the mother’s uterus where it will develop as a normal human baby, except it was specifically chosen out of a larger pool of fertilized eggs. While we are far from having the ability to engineer more complex traits, imagine a world where we could, and it wasn’t extended to just eye color, but with specific personality, intelligence, and physical traits? This is no cheap procedure, and I already know this would be limited to just the upper class who can afford the expense of having genetically designed, taller, smarter, hotter or more athletic children. The advantages would become evident not at the age of a career, but in one’s primary education. Even at a youthful age, these would be the kids getting into the top colleges or being scouted for sports, already causing a disadvantage as early as age 16. There eventually would be an evident social divide, as some naturally born humans who are not athletic, aesthetic or intelligent may feel like a second-tier human. These designer babies would not only live longer due to more robust health, but they can also hold higher and more well-paying jobs as adults, being able to afford the expense of designing their own children, thus completing the cycle. Cover crops have many benefits in many ways. Cover crops can benefit in many ways including preventing soil compaction. Tillage radishes, used as a cover crop, can go grow up to 3-foot-long and roots growing up to 3-foot long. This can be beneficial to the cash crop to help roots to expand and grow down for support. Tillage radish also put nutrients back in the ground when they decompose. and can prevent wind and water erosion. The main purpose of cover crops is to build up fertility levels and prevent fertility levels from dropping off. Cover crops can be a tricky a crop to put out and be beneficial. Cover crops can mess up the fertility a lot if not grown correctly. If the cover crops are put out too late it will have no effect on the fertility of the soil. If put out to early it has the same effect they won’t build or prevent anything. Cover crops can be beneficial by building organic matter, and fracturing the compaction layers in the ground for roots to dig down deep. It benefits the environment as well by preventing erosion, and putting nutrients back in the soil which leads to less artificial fertilizer. Throughout our class discussion on invasive species, one species keeps coming to mind: palmer amaranth. I continually think of palmer amaranth because a grower, that is one of our constant thoughts. Will palmer amaranth make it to my part of Ohio? Will I have to battle it for years to come? Palmer amaranth is an Amaranthus species and is in the same family as weeds such as water hemp and redroot pigweed. It has begun making it its way from the South to many areas throughout the Midwest. Palmer amaranth is a very problematic weed, and invasive species, that many growers are concerned about. 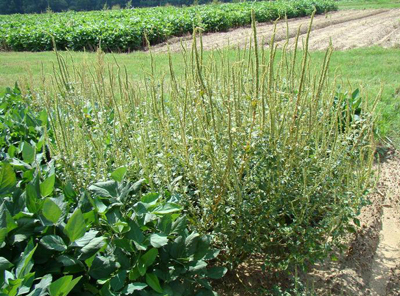 Like many other invasive species, palmer amaranth is characterized by its fast growth and ability to rapidly reproduce. Female plants can produce 100,000 to 500,000 thousand seeds. The plant has adapted well to a wide variety of growing conditions and it has a broad window of emergence. Once emerged, palmer can grow up to 3 inches per day. Palmer amaranth greatly reduces the yield of any crop. Not only is palmer amaranth an invasive species with unfavorable characteristics, but it is also resistant to herbicides including glyphosate (one of the most commonly used herbicides). This make prevention only that much more important. Prevention includes sanitation to avoid the spread of palmer, good cultural practices, and removal of plants. Palmer amaranth was spotted in my county and was brought there by a piece of machinery that was bought out of state and was not cleaned before being brought into Ohio. There was still palmer amaranth seed on the machinery. It is also important to educate the public on the potentially devastating effects that palmer can have. Educating the public is important to bring awareness to the techniques to prevent the spread of palmer amaranth. My family is fearful of palmer amaranth like many other growers, but we need work together to prevent this invasive species from overtaking our farms and reducing our yields. People love bananas. Bananas rank fourth as a global staple food. The top three are wheat, rice, and corn. Americans eat bananas more than any other fruit. They are now under attack. However, this is not the first time that bananas have been threatened. Until the mid-twentieth century, the most widely consumed banana species was Gros Michel, or “Big Mike.” This species was wiped out by a fungus known as Fusarium Wilt or Panama Disease. The soil borne pathogen infected the roots and vascular system of the crop. The disease spread easily in soil, water and infected plants. Worse yet, the disease stayed in the soil for decades. This caused huge economic problems for banana producers and distributors. The solution to the near extinction of Big Mike was finding a species resistant to this disease. While there are hundreds of species of bananas, Cavendish was found to be resistant to Panama Disease which led to its increased production solving the world’s banana deficit. Today it faces its own threat. The reason these bananas are being threatened by disease so easily is because commercially produced bananas are all the same. They are effectively clones of each other. Removing variety makes crops more vulnerable to disease. With the Cavendish being a species that is cloned, disease could not only wipe out the species, it could easily become a threat to global food security. Scientists have been investigating methods to help make Cavendish bananas resistant to these diseases. One method being researched is genetic modifications. This means DNA from other banana species resistant to the diseases could be implanted into Cavendish bananas to protect them from the diseases. Agricultural technology has improved greatly. The fungal genomes have been sequenced. This allows scientists to understand the evolution of this virulence. Hopefully an intervention can be developed. This is important not only to save the Cavendish but to protect the environment from large amounts of fungicides. Hopefully people will not be singing “Yes, we have no bananas” anytime soon. Abigail Newburger is a fifth-year undergraduate student at The Ohio State University. Originally from Potomac, Maryland she is hoping to move back to the Greater Washington D.C. area to work in the nonprofit sector. Drenth, A., Kema, G., & Stergiopoulos, I. (2016, October 23). With the familiar Cavendish banana in danger, can science help it survive? Retrieved June 18, 2017, from http://theconversation.com/with-the-familiar-cavendish-banana-in-danger-can-science-help-it-survive-64206. In comparison to traditional agriculture, I think the outside opinion would be that golf is not an agricultural industry. In reality, golf is not much different than the cash crop business. Farms utilize farmers to generate and cultivate beautiful food products and golf courses utilize a golf course superintendent plus staff to generate healthy turf and playing condition. Consumers pay high prices for the best fruits and vegetables and consumers pay high prices for the best turf and playing conditions. Poa annua is a turfgrass found in abundance in coastal golf courses in a cool weather climate. It serves as a nice surface on putting greens and fairways when used as an independent plant, but when it is introduced with another species of turfgrass it causes many problems. In my opinion, Poa annua control is one of the most difficult battles a superintendent must fight. Poa annua grass is a plant with shallow roots that consume more water and sunlight than surrounding plants, for example, creeping bentgrass. In addition to its battle for water and sunlight, Poa annua has over 30 different subspecies that make it difficult for herbicide to eradicate all the plants in an area. Once a Poa annua seed germinates it can produce up to 600 seeds in a year. These characteristics culminate to a plant that is unwanted and considered invasive. Once Poa annua grass invades a putting green, it creates a bumpy surface for a ball to roll upon. An inconsistent putting surface is a blemish upon the reputation of a golf courses’ condition resulting in a decrease in revenue. Poa annua grass can be controlled, but it takes time, effort and money. These resources are limited at many golf courses, helping to accelerate the spread of Poa annua across the sport. Anoplophora glabripennis, also known as the Asian longhorned beetle, is an invasive species native to Asia. These beetles are notorious for destroying many hardwood forests. The species was first discovered in the United States in 1996 in New York City. The beetles target species of maple from the Norway maple, silver maple, sugar maple, sycamore maple to boxelder trees in New York City. They target the trees for food and habitat for mating.Once the beetle larvae emerge they eat the bark of twigs and they mate on the branches and trunks. The female eats through the bark and usually lays one egg ranging from 5-7 millimeters long. The females lay about 25 to 40 eggs in their lifespan. The eggs then in turn hatch in one to two weeks. Full grown larvae reach 50 millimeters in length. Once they hatch the eat in the cambial region of the tree and then the enter the center wood. They tunnel upward for 10 to 30 centimeters. The females usually lay their eggs in the months from July to early November. The mating and eating of the tree ultimately destroys it. These beetles can fly up to several hundred meters in order to find a new host and can live for more than forty days. Beetles can be accidentally moved around by arborists and people who sell firewood. The beetles probably came from Asia and China on infested wooden packing materials. Asian longhorned beetles will use healthy trees, stressed tress and or recently cut logs to eat and use for mating purposes. Many trees and forests that have been infected with the Asian long horn beetle have to be replanted and closely watched. There are no U.S. Environmental Protection Agency-approved pesticides which effectively control the Asian long horned beetle. They do have new rules saying that all solid wood packing material from China has to be heat treated, fumigated, or treated with preservatives. Haack, Robert A, Kenneth R. Law, Victor C. Mastro, H S. Ossenbruggen, and Bernard J. Raimo. “New York’s Battle with the Asian Long-Horned Beetle.” Journal of Forestry. 95.12 (1997): 11. Print. There has been a recent law that has a large majority of Columbus citizens very distraught: no pups on the patio. Here’s the catch- the law is not really recent. Not allowing live animals in food related establishments is a law that has been set in place for ages. Columbus, primarily the Short North Area has become very dog-friendly. Most shops in the area have had dog-friendly signs in their windows since it was likely a potential customer was already out walking their furry friend. Restaurants began hosting events with shelters or rescues and widening their consumer base. The popularity of these events is when the Franklin County Department of Health stepped in and sent out a reminder letter to food related establishments that they actually breaking the law. Ohio Uniform Food Safety Code Section 3717-1-6.4(O) to be exact. • Ringworm, caused by fungus. Transmitted through direct contact. Back to the server/cook analogy. Hands aren’t washed, germs are transferred to the food, plate is served to the customer. Customer gets sick, possibly chronically, and sues establishment. That is the worst case scenario. However, dogs are not likely to pose a threat if they are well-behaved, vaccinated, and have regular vet visits. Especially if they are in outdoor patios. We should trust our community and the businesses themselves to dictate on where dogs are allowed, though I do believe the Ohio Health Department should make guidelines. Morgan, Tara. “No Pups on the Patio Allowed at Restaurants.” WSYX. FOX28, 25 May 2017. Web. 18 June 2017. “Healthy Pets Healthy People.” Centers for Disease Control and Prevention. Centers for Disease Control and Prevention, 14 July 2016. Web. 18 June 2017.